Another day in the new highsec. Miner EDISON ENGLISH was attempting to gather ice when he found himself repeatedly bumped by our Agents. It took him several minutes to return to his keyboard, but when he did, he made a startling announcement. EDISON purchased a mining permit a month earlier when Agent Kalorned showed him the error of his ways by killing his Covetor. Was EDISON truly reformed, or only faking? Our Agents are excellent detectives, but the cases usually aren't that hard to crack. EDISON warned the Agents that the judgment of James 315 was inescapable. True enough, but why wasn't EDISON himself worried about said judgment? 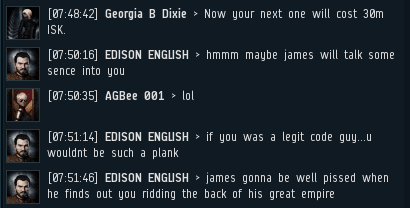 Unexpectedly, EDISON dropped a bombshell: He was in direct contact with the Saviour of Highsec on Facebook! The vulgar miner was greatly distressed by the bumps, but nevertheless confident that he'd ultimately prevail. Could he really have an "in" with highsec's Supreme Protector? 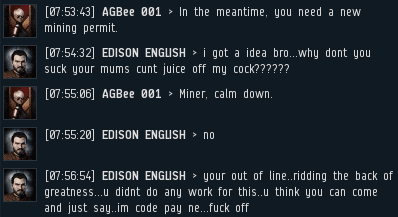 We've often seen miners threaten to petition CCP or contact their powerful friends in nullsec. The next, logical step in the evolution of this tactic is to claim to know an even greater power in EVE. EDISON's provocative statements drew the attention of additional Agents. His case was becoming a high priority. EDISON didn't want any confusion, so he made things crystal clear: James 315 was a friend of his, and he was sick of people bumping miners in his name. ...So maybe it wasn't a close friendship, but EDISON could still say with authority that the Saviour wanted his mining ship to be left alone. Agent Lillie Naari was skeptical. For some reason, it just didn't have the ring of truth. EDISON assured our Agent that once his Facebook account was fully booted, he'd have all the evidence he needed to prove his claim. EDISON's efforts quickly hit a snag: His Facebook contact was offline, and screenshots could not be posted without clearing a few additional hurdles. Lillie questioned the miner further. EDISON grew indignant. Why couldn't these Agents see that he had friends in high places? 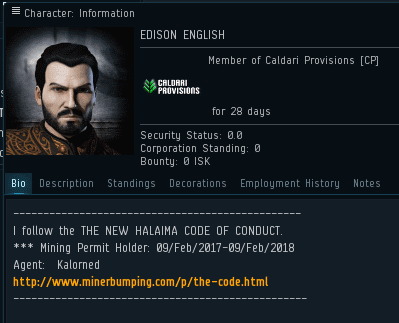 Then EDISON dropped another bombshell: The Saviour of Highsec had gotten fed up with all this "Code" business, and the mighty CODE. alliance was dead. ROFL this looks like a good one! Didn't another miner try this same tactic before? LOL. The CODE. alliance will never disappear from the cluster until the last star goes out. Who the hell cares if he knows James or not I'm sad I didn't get to pop him, would have sent a message to James that he doesn't matter anymore. We just kill miners to kill em now, screw the permits. Proof that you kill miners, or you are one. Yes everyone, proof of kills or terminate yourselves. Did peoples hurt his pooper? CODE. appears to have been dying/dead since 2012, if the carebears are to believed. Source, some numbnutt highsec shitter. Insulting code is against the code, terminate yourself. Foul language is not acceptable by code, terminate yourself. What's this miner doing to fb? Sticking his boot where? Why didnt antiganking stop the gank? Ever notice how capsuleers with their names in ALL CAPS are always bad? Just a little spoiler. If you have john e normus on facebook you have james on facebook. James is the anti feminist dude.